The two train skeleton clock based on the design of James Condliff, Liverpool circa 1860. This is the latest addition to the range of skeleton clocks made by Sinclair Harding, based on the series 2 style manufactured by the famous Liverpool clockmaker James Condliff. In the Victorian era may be less than 100 skeleton clocks of various styles by this company were made and very few of the original skeleton clocks ever appear at auction. This latest Two Train Skeleton clock is possibly the most elegant of the Condliff clocks with extremely delicate frames. Sinclair Harding use the latest technology with CNC machines producing components of great accuracy, however all clocks are individually polished by hand to a high degree of finish. A number of Condliff's clocks had normal wheel trains with pendulums, this clock has a large balance wheel with helical balance spring surmounted at the top of the clock frame this gives a most attractive and balanced look. The clock beats seconds and this is shown by the centre sweep seconds hand against the hand silvered chapter ring, all the hands and striking work are polished and blued. A French polished wood base is used which is built in a box section to house the bell, the clock strikes on the hour. A very elegant bevelled glass shade with an opening door is supplied to keep dust away from the very fine mechanism. The movement is protected by a bevelled glass shade with an opening door allowing the winding to be carried out without having to remove the shade. The Two Train Condliff has an elegant centre seconds. The large balance wheel and hair spring is suspended from the delicate frame. 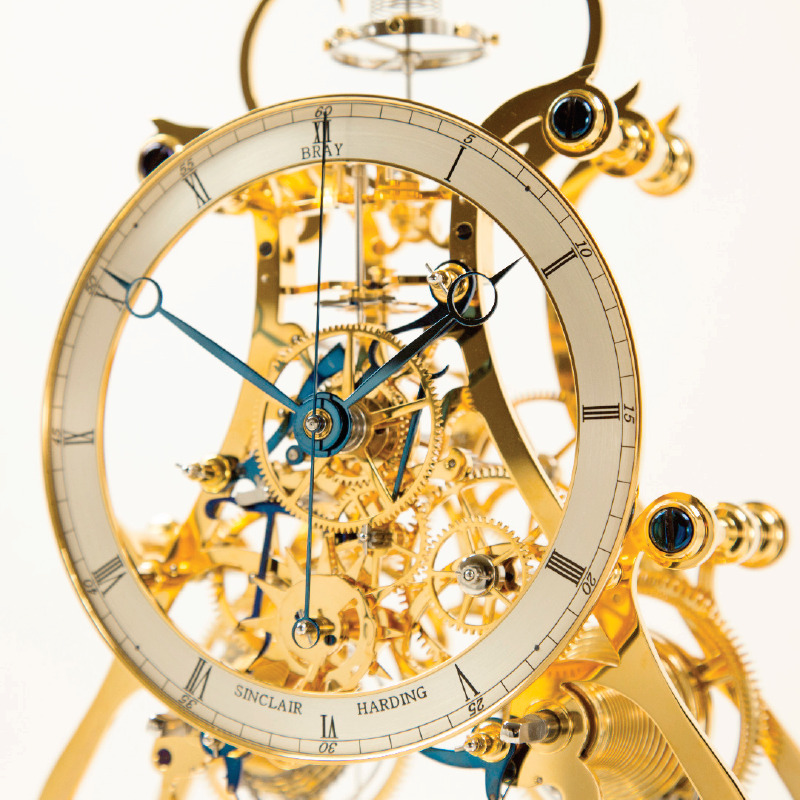 The 8 day movement is driven by the two Fusee chains. The detail of the click springs are polished and hand blued.